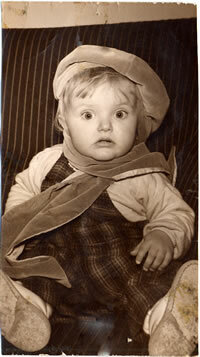 Born October 15, 1955 in Oslo, Norway. Like all Norwegian babies I am born with skis on my feet – just kidding! But, honestly, my parents bundled me up and cross-country skied with me in a sled before I was a year old. Meet my first troll. It is dead, so I survive! 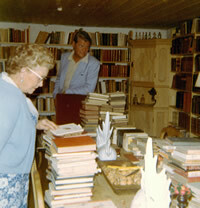 My father leaves the publishing house where he was in charge of the old and rare book collection and starts his own business. Our house becomes an antiquarian bookstore (a book must be at least 100 years old to be called antiquarian). I love living among the huge stacks of musty old books and the wall-to-wall book cases. My brother and I help polish the most beautiful leather bound volumes every night. I dream of becoming a book-binder. I enter elementary school. My heartless teacher (another troll?) believes superior penmanship is linked to superior intelligence, and since my handwriting is appalling, I am relegated to sitting among the “bad” boys. When I also prove a slow reader, the teacher declares me hopeless and “must sail my own sea.” Despite my love of books and stories, a career involving the written word seems unlikely. Forced to eat dark bread with yellow cheese (YUCK) during an all-school health fair, I pretend to faint. Clutching my throat, I stagger to my feet and collapse on the floor in a lifeless heap. Every parent, teacher, student, even the principal, stop eating and stare. The nurse carries me out and away from the dreaded sandwich, examines me from head to toe, proclaims me ill, and sends me home. Yeah! Everyone is fooled, except my parents, but they appreciate a good show and play along. A career in acting now seems possible. I participate in every skit and dramatic activity the school has to offer. My penmanship is still bad. Middle school and I turn out to have a gift for foreign languages. I excel in English, German and French. My parents excitedly discuss the possibility of me becoming a secretary to a boss who does international business and will need language expertise. He will surely fall in love and marry me. I fail typing class to prevent such a fate. Because I’m good with languages, I am allowed to take orders from customers who call from all over the world to buy rare books from my dad. Sometimes, when they want to buy a book that I really love, I tell them it’s sold already and hide the book. I still have some of the ones I hid! Enter Nadderud High-school. Despite earlier predictions, I have turned into a good reader and a pretty decent student. Unfortunately, I love talking and keep getting in trouble for speaking too much. But I join the theater group. Finally my loud voice and love of an audience is appreciated. I come to the United States to visit family friends, the Parkers. It was April in Minneapolis and unusually hot. I try to open a second story window and send it crashing to the ground because I have never heard of storm windows. I also accidentally smash a pop machine with a bowling ball when it slips out of my hand. The Parkers send me to stay with their daughter at Augsburg College to give me a “flavor of American college life” and probably also to save their house and surroundings from further damage. Meet Steve Kuross and fall madly in love. Win a Crown Prince Harald Scholarship from the Norway-America Association to attend Augsburg College in Minneapolis, MN for a year. After that year, I’m still in love with Steve and not ready to return to Norway. To help pay tuition, I get a job in the children’s library at the college. I work 32 hours a week and spend most of the time reading children’s books. It’s GREAT! I’m riveted by Winnie-the pooh, The Wind in the Willows, The Borrowers, The Little House on the Prairie, the Hobbit and everything by Dr. Seuss. I take a class in children’s literature and tell my first story: “The Three Billy Goats Gruff.” It’s such a hit that I end up telling stories in libraries and classes all over the city. I’m sure it helps that I can’t accept money since I’m a foreign student. However, I do get a lot of nice dinners out of the deal. Storytelling career takes off when Swedish author Maria Gripe gets stuck in Chicago because of a blizzard and I get persuaded to “substitute” for her. I happily tell Norwegian tales to the several hundred librarians and children’s literature lovers. Now I get lots more storytelling jobs and I still can’t get paid. Begin graduate work in Theoretical Linguistics at the University of Minnesota. Two terms later I sit weeping in the office of the children’s literature professor, Dr. Odland. I love language, but HATE theoretical linguistics. Dr. O persuades me to switch to Applied Linguistics and minor in children’s literature. I do, and I love it and write my thesis on using folktales and storytelling to teach English to foreign students. I get my Masters degree. 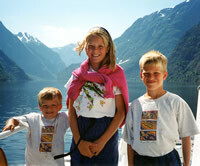 Steve (now in medical school) and I get married in Norway. I get a Green Card – I’m a “permanent resident alien,” which means I can’t vote, but I can get paid for work. Hurray! I get my first real job teaching English as a Second language at the College of St. Catherine in St. Paul. I study folklore at U of Oslo. Get a grant to study ways of using folklore and storytelling in the ESL classroom at the College of St. Catherine. 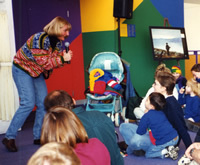 I take folklore classes at U of M, and teach storytelling classes at Hamline University in St. Paul. I love folktales and wonder if I should become a folklorist. Beautiful Emily is born. No time to pursue folklore degree. Emily has inherited her mother’s vocal chords and uses them all night long. But I keep teaching, telling stories, and taking classes. I am still thinking about pursuing a Ph.D in folklore. To check out what folklorists are like, I write a paper called “Legalizing Lutefisk.” It gets lots of attention and lands me on two TV specials: Turner Broadcasting and Minnesota Public Television where I have to cook Lutefisk dinners for people who have never tasted it and tell silly Lutefisk jokes. 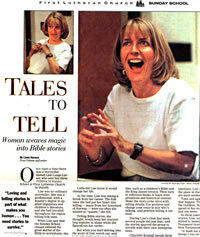 Actually, I tell some other stories also and get on the cover of the local TV guide. A son, Even Christian, is born. He, too, is stunningly handsome and has excellent vocal chords. Erik, who is unbelievably cute, is born. I forsake all notions of any more advanced degrees and spend my time telling stories to my children and anyone else who will listen. 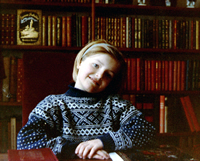 Teach children’s literature, tell stories everywhere, ski, hike, knit, read, garden, travel back to Norway once a year and have fun with my family and friends. Finally overcome my reluctance to typing and, with Margi Preus (who types super fast), write The Legend of the Ladyslipper. It is published in 1999 by Houghton Mifflin Since then, I have written six more books (The Troll With No Heart in His Body, The Race of the Birkebeiners, The Hidden Folk, Noah’s Mittens, The Adventures of Thor the Thunder God, and Gifts From the Gods. Ancient Words and Wisdom From Greek and Roman Mythology.) I have won the Minnesota Book Award three times….and I still hate to type. But I love sharing my favorite stories with people, and I especially love all the interesting questions people ask. It has helped me realize how important stories are, especially the old ones that have survived for hundreds, maybe even thousands of years. They are wise in ways that are hard to explain, so I have collected some of my favorite quotes about folktales to help me express how important I think they are. 1961 ~ Here I am dreaming of becoming a book binder. 1961 ~ The red bookcase is my favorite. See how well polished the books are. 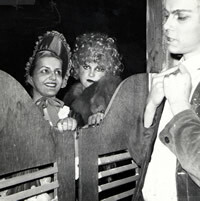 Here I am in a play called “Gunsmoke.” It was based on an American TV series by the same name. That TV show was incredibly popular in Norway. 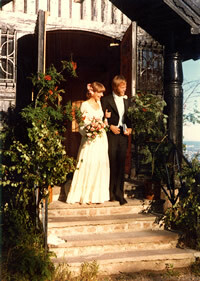 1978 ~ I get married in Norway. 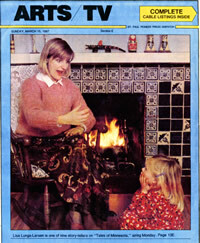 Here I am with my daughter Emily on the TV guide cover – we’re famous! I spend my time telling stories to my chldren. 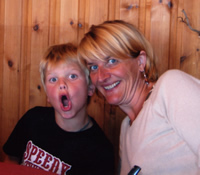 Here I am scaring my nephew Peder.